Spring sprung up a bit early around here. The altheas came out first in mid-February, which seemed too early. A desert willow that I feared had died last year came out a couple weeks ago, too. 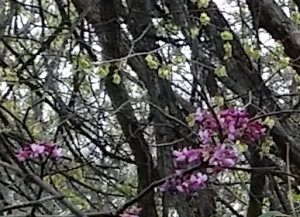 Here’s an attempt at a picture of the redbud tree nearby, behind which is an elm that has been gracing us with quite a bit of pollen of late. My attempts at gardening with annuals always seems to fail–far too many critters around here end up eating what I plant. Ah, well. Maybe I should say I’m growing the odd assortment of small birds, muscovies, and squirrels?